Festival time is approaching again! This year the Festival of British Archaeology will be running from the 12th to the 27th of July. Over 1000 events have been organised throughout the UK, celebrating the best of British archaeology. The range of family events, lectures, guided walks, and training events mean everyone can get involved. We will be helping kick off events in Norfolk at Gressenhall Farm and Workhouse on the 13th of July. The annual Archaeology Day will showcase the diverse heritage of our county. 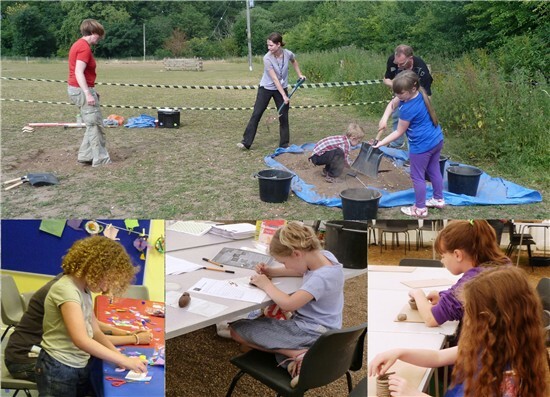 Meet the experts who work with Norfolk's archaeology and find out what's in our archives, make your own Mesolithic tools, or even become an archaeologist yourself by excavating in our special test pit. The fun continues on the 19th of July when we will be at Norwich Castle Museum for their Roman Britain event. There will be a series of fascinating talks on the Romans with speakers including Chief Curator John Davies and numismatist Dr Adrian Marsden. On the 19th and 20th there will also be a range of family activities in the castle, including a chance to recreate Arminghall Henge, identify archaeological finds, watch flint-knapping and more! Other Norfolk events include guided walks and talks by World Tree; excavation open days and training courses at Sedgeford; community test pits in Binham and even a War of the Roses living history weekend at Oxburgh Hall.